A collection of 60 rare classic cars has been uncovered rusting away in a French barn and will now be sent to auction. The vehicles are to be sold by Artcurial Motorcars in Paris on 6 February 2015 and have been given an estimated value of between £9.4 million and £11.8 million. Among the 60 cars are some of the finest models from the 1930s, ‘40s and ‘50s. To come across a treasure trove of classic cars like this is the Holy Grail for any car dealer. But, should they be so lucky as to uncover such a find, they must ensure they have a road risks insurance policy in place that will enable them to drive the classic vehicles from the abandoned location to a new, more suitable home. The collection in question was amassed by French haulier and car enthusiast Roger Baillon, who acquired the vehicles in the 1950s, ‘60s and '70s. His dreams of opening a classic car museum never materialised and instead they were stored in iron shelters on the outbuildings of a farm – Mr Baillon died 10 years ago and his son Jacques died last year, with the vehicles laying dormant the entire time. The classic cars were then inherited by Mr Baillon’s grandchildren who called in specialists Matthieu Lamoure and Pierre Novikoff of auctioneers Artcurial Motorcars to estimate their value. The vehicles were rusted and in a poor condition but so rare are some of the models in the collection that together they are expected to fetch north of £10 million at auction early next year. 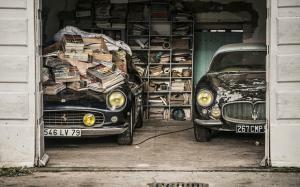 Among the 60 cars up for sale are a Ferrari once sat in by Jane Fonda, which was found hidden under a pile of old magazines (pictured), and a Talbot-Lago previously owned by extravagant Egyptian King Farouk.